Lightweight and easily portable; rust & corrosion resistant.10" x 4" pneumatic tires. The ultimate lightweight aluminum handtruck for variable material handling needs. Converts simply from vertical to horizontal position in one folding motion. Large 8" x 18" beveled toe plate helps loads stay in place.Twin pin handled model features 5" swivel casters and provides a 650 lbs. load capacity in the horizontal position, 500 lbs. capacity in the vertical position. FOB Shipping Point. H45136 40	 Convertible Aluminum Hand Truck; Twin Pin Handle. 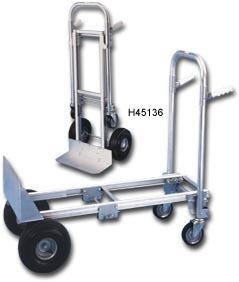 H45146 52	 Convertible Aluminum Hand Truck.